The Linx MS Long-Range Handheld transmitter is ideal for remote control and command applications requiring longer transmission distances. Available in 315, 418 (standard), or 433.92MHz versions, it has been pre-certified for FCC Part 15, Industry Canada, and European CE (433MHz) compliance. This dramatically reduces development cost and time to market. When combined with an LR Series receiver, the transmitter can operate at distances of up to 1,000 feet. This comprehensive Master Development System is designed to assist in the rapid evaluation and integration of the Long-Range Handheld transmitters. The all-inclusive system features a pre-assembled evaluation board, which includes everything needed to quickly test the operation of the transmitter, receiver, and decoder. When you are ready to begin development, a convenient prototyping area with breakout headers and regulated power supply on the receiver / decoder board allows for rapid testing and interface. In addition to its stand-alone functions, the board can also be connected to a PC via a USB connection. Powerful demonstration software is included which audibly and visually demonstrates the capabilities of the system. 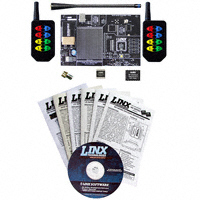 Technical support for the system and all on-board Linx products is included.